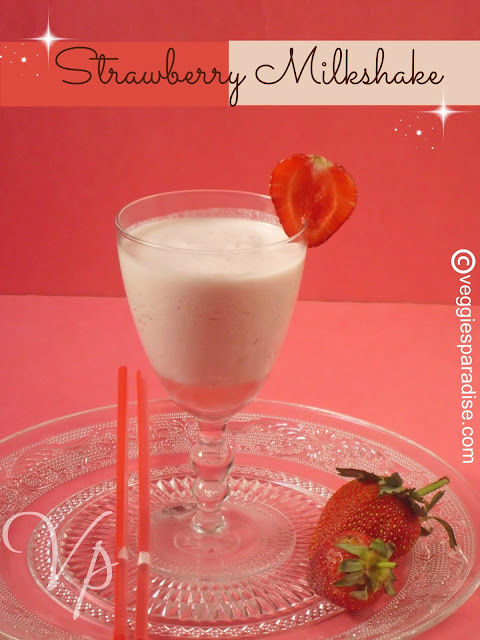 Strawberry Milkshake : Milkshakes are always a treat for kids, they can be either refreshing and fruity or smooth and creamy.You'll love this fabulously indulgent drink, prepared with only three ingredients. Hull the strawberries and place them in a blender or food processor with sugar. Add the milk and blend until smooth and frothy. Check for sweetness and add sugar if needed. Strain the mixture through a sieve. Pour into a glass and serve decorated with extra strawberries or top it with a scoop of ice cream. A very simple recipe to enjoy any time. beautiful clicks.. and yummy milkshake.. Very refreshing and beautiful drink. I like strawberries but never had strawberry milkshake..
wow..so refreshing..esp for the hot summers..
can I hv a cup? awesome clicks and very refreshing drink! Hi Aruna,Thank you for stopping by my space.Love the way u have kept ur blog every little detail looks so good,happy to follow u too.